This complete website comes free with the Blackford Centre for Life Coaching’s Diploma in Life Coaching course. If you went to a designer, they would charge you at least £385 for this work. And because we know what clients want from a life coach’s website, the pages are better than what a designer would provide. As well as the cost saving, it’ll save you hours of briefing, weeks of delay, and much trial and error. The site comes in five different colours, to give you the right look for who you are. The pages contain sample text. 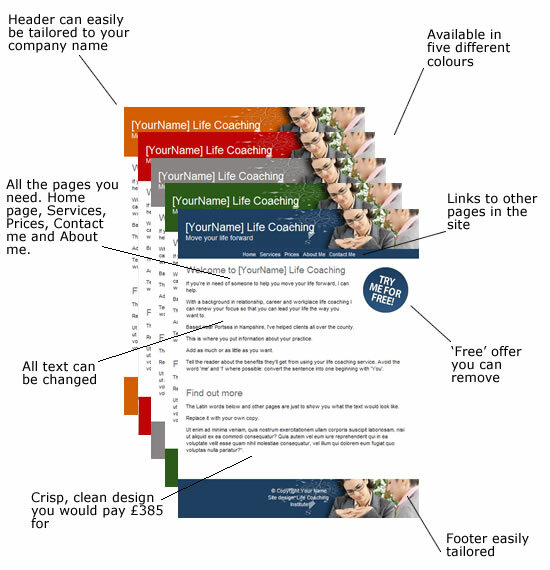 Just change the copy to suit your needs, upload it to your site, and you’ll have your own website!